Monitoring the Mental Health Act in 2014/15, our annual report into the use of the Mental Health Act (MHA), tells you about the experiences of people who received care under the act in 2014/15. There are 57 mental health NHS trusts and 86 independent mental health hospitals registered with CQC. Throughout the year we visit these services to interview patients and review practice. Our Second Opinion Appointed Doctors also made 14,375 visits to patients in hospital and the community and we received 227 notifications following the death of people detained in hospital. In the spirit of consistency with physical health services – true parity – psychiatric patients need to be fully involved in decisions about their treatment. In our monitoring of the MHA we expect to see providers following the standards of the Act and its Code of Practice, and have information and data systems in place that tell them where improvements are needed. However, our findings have shown that services were struggling in 2014/15 to meet the previous Code and failing to collect or review information for use by leadership teams. At a time of national commitment to ensuring parity exists for people using mental health services, our findings demonstrate this is not being consistently realised for the people we have spoken to over the year. Although we will continue to monitor the way the MHA and Code are applied, we will not see a real change without a system-wide effort to tackle these issues and improve the care provided. We found many examples of services making improvements following our visits and observed good practice in the way providers are supporting and protecting patients’ rights. However, we also highlighted issues with the way the Code is being applied. The biggest issue we found for patients who were subject to the MHA in 2014/15 was a lack of support to be involved in their care and treatment. This included the information they were given, access to external support such as advocacy, and care planning. We are concerned by this finding, as not supporting patient, family and carer involvement may limit people’s recovery and could result in longer stays in hospital, poor discharge or an increase in the potential for readmission. We have also found some examples of outstanding care, including around reducing the use of restrictive interventions and the involvement of carers. We encourage other services to learn from these and consider how they can be applied in their local areas. We are concerned by the lack of an independent system for investigating the deaths of detained patients in healthcare settings, and believe there is much greater opportunity for learning to take place when deaths occur, and for improvements to be put in place. 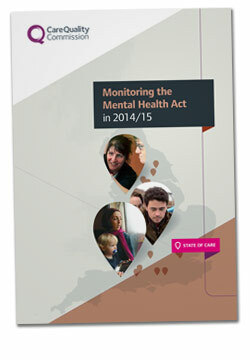 Read our news story on the Mental Health Act 2014/15 report. Read our press release on the Mental Health Act 2014/15 report. See an infographic showing key findings from the report. Read the State of Care 2014/15 report. Read the Deprivation of Liberty Safeguards 2014/15 report. Download the annual National Preventative Mechanism 'monitoring places of detention' reports. Speak up and tell us by calling 03000 61 61 61, emailing enquiries@cqc.org.uk, or using our online form.